Sports Costs > How Much Does a Golf Simulator Cost? How Much Does a Golf Simulator Cost? 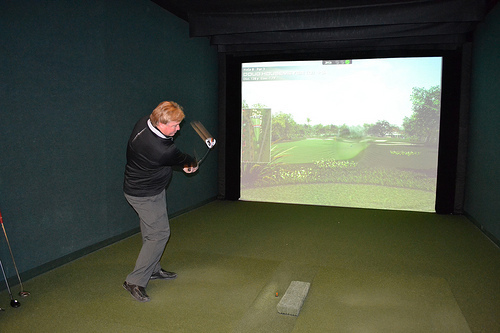 A golf simulator is a way to play golf without having to go to the course itself. These simulators can be used any time of day and any time of year since it will be in a climate controlled setting. You will no longer have to worry about factors such as wind and rain, although you can simulate these conditions if you would like a challenge. A simulator works by allowing the user to hit a golf ball into a screen, and once the ball hits the screen, the ball is then shown where it would on the course if you were to hit the ball like that in a real situation. While these simulators are often found available for use at sporting goods stores and golf courses, there are also simulators available for those that want to purchase them for their own personal use at home. The price of a golf simulator is going to vary depending on the brand, features, condition and where it’s purchased from. A golf simulator, depending on the factors mentioned above, can cost anywhere from $28,000 to as much as $75,000. Since the features, brands and customization can vary, the price is going to wildly fluctuate. Refer to our table below to see what the most popular simulators cost. The Golf Channel recently had an episode where they claimed that an at-home simulator could be in the $50,000 price range, and this price would include the simulator as well as the installation. For instance, the popular ProTee Golf Simulator is available on their website for either $27,999 or $33,599, depending on the brand that you choose. Other companies, such as TruGolf.com, offer its Premium Golf Simulator for $44,950 and their Signature Simulator for $33,950. TrackmanGolf.com lists its prices online and says its Trackman Simulator starts at $49.995. If you would like to simply use a golf simulator at a store or private range, the price is usually charged for the amount of time you use the simulator. This can range from $25 to $40 per hour. There are also simulators at stores or courses that are used to give lessons to golfers who would like to improve their game. Golf simulators offer 3D/high definition technology that simulates actual golf gameplay. Able to play courses in your home, these simulators allow you to use your own clubs as if you were actually swinging and playing. Most of your simulators will have you stand about 20 feet from the screen, where you will tee off just like you would at a driving range or a tee box at a golf course. Depending on the brand, some enable you to play with more than one player. Most models, depending on which one you use or purchase, will also allow you to play popular championship golf courses across the United States as long as they have the licensing rights. Many include anywhere from 35 to 65 courses. Some models can analyze your swing and give you pointers on how to improve it. The screen will be made of a tough nylon mesh screen to prevent any damage from the golf balls. The simulator will also be surrounded by steel frames to prevent the ball from bouncing around. Most models will come with a limited warranty that lasts anywhere from one to five years. Depending on the simulator, additional software packages can be purchased, similar to a video game system. These software packages can get extremely expensive, again, depending on which simulator you use. Each course that you purchase will be an extra cost. Plan on spending $500 or more for each software add-on. Aside from the software add-ons, many brands offer premium advanced modules as well. This can include a full swing analysis, special accessories and more. Some simulators can be hard to install. If this is the case, you may have to bring in a professional contractor in order to make sure it functions and is installed correctly. To find a contractor to help you install a simulator, consider using HomeAdvisor.com for multiple free quotes in your area. Before you think of getting one, remember that these simulators require a larger room. In fact, most require a ceiling as high as 12 feet. If you do not have the adequate space, you may not be able to get one installed. For example, Trackman Golf, the company we mentioned prior, recommends a room height of at least nine to 10 feet and a length of at least 18 to 25 feet long. Many simulation companies offer live demos. Consider calling up the company to see if you can meet at a location to test it out. You may also find them testing their simulators at many golf expos. If you are serious about getting one, you may want to attend an expo at which they are featured. While rare, some golf simulators can be purchased online used. If going this route, you can potentially get one for as little as $20,000. There are products such as the Dancin Dogg that are highly rated simulator that costs less than $500. Hook it up to your computer and the simulator can analyze your swing in a 3D golf environment. Also, if you do not want to spend thousands of dollars, consider looking at other low-cost options where you can build your own package such as P3ProSwing.com. Golficity.com shows you how you can build a simulator for as little as $2,000.